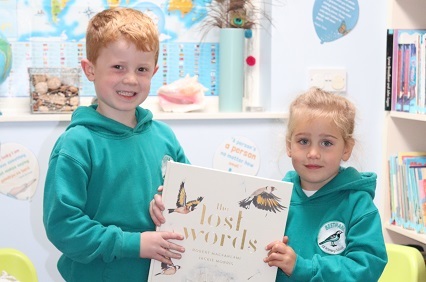 Arnside & Silverdale Area of Outstanding Natural Beauty has donated a copy of ‘The Lost Words’ by Robert MacFarlane and illustrated by Jackie Morris to each of the primary schools in the area. The Lost Words is a book of beautifully illustrated poems about nature words which have vanished from the Oxford University Press Junior Dictionary because they weren’t being used enough by children to merit inclusion. The words removed included bluebell, conker, heron, acorn and kingfisher. Robert MacFarlane wrote the book as a ‘spell’ book – a double meaning as he hoped to ‘magic’ the words back into usage, and also used the first letter of each word as the first letter of a line of poetry. There is now a national crowdfunding campaign to get these words back into our school libraries and our children’s vocabularies. Arnside & Silverdale AONB were keen to support the campaign and have provided a copy for the libraries of Arnside, Beetham, Warton Archbishop Hutton’s, Storth, Silverdale St John’s and Yealand Schools. Since it was published the Lost Words has won Hay Festival Book of the Year, Books are my Bag Beautiful Book of the Year, and shortlisted for the Nation’s Favourite Nature Book and the Countryfile Book of the Year.